Summer makes cooking very easy as it supplies us with a glut of beautiful and delicious ingredients to use. At the top of both those categories are Ranier cherries. Super sweet, with golden flesh and a bright red blush, you could do very well with just placing them in a bowl and letting your guests go at it. For those interested in a slightly more elaborate treatment though, this salad balances the Ranier’s sweet flavor with the bitterness of endive, smoky black pepper bacon, and creamy hazelnut butter. For this recipe, it is recommended to use thick cut bacon. Thinner cuts won’t break down properly and you’ll end up with bacon bits instead of the nice crispy lardons the recipe calls for. Using a thick cut, and cutting the bacon into a small dice before rendering slowly will get you the best results. Cook the bacon over low heat very slowly to cook all the fat out, then drain on a paper towel lined plate. Reserve 3 tbsp of the bacon fat for your vinaigrette. Toss the hazelnuts in olive oil and salt before roasting the oven, then cool. To remove any skins from the hazelnuts, simply dampen a towel and clean the skins off after roasting. It's important to let them cool after roasting them in the oven. Placing them directly in the food processor while still hot will cause the hazelnuts and oil to separate and prevent the “butter” from coming together. If this happens, or if you accidentally add too much oil, add in a tbsp or 2 of cold water to bring everything back together and smooth out the texture. You want to shoot for a very creamy and easily spreadable consistency. Preheat your oven to 375°. Toss the hazelnuts in a tbsp of olive oil with salt to season before transferring to a lined sheet tray and placing in your preheated oven. Roast the hazelnuts for 12-15 minutes until golden brown. Transfer the nuts to a paper towel lined plate and place in the fridge to cool. Once cool, place the nuts, honey, salt, and vanilla extract into a food processor. With the motor running, slowly start to drizzle in the remaining 5 tbsp of olive oil and process until very smooth and creamy. Meanwhile, place a saute pan over medium-low heat and add in your bacon. Render the bacon slowly until very crisp then transfer to a paper towel lined plate to drain. In a food processor add the cup of pitted cherries along with the champagne vinegar and chopped thyme. With the motor running, add the reserved bacon fat a tbsp at a time. Transfer the vinaigrette to a small bowl and chill. To assemble, run a long streak of the hazelnut butter across the plate before adding you endive leaves, mache, and cherries. Fill the endive leaves like cups with the cherries, goat cheese, and bacon, before liberally adding dollops of the dressing around the plate. Summer has come on strong, making the idea of turning on the oven and making the kitchen even hotter very unappealing. 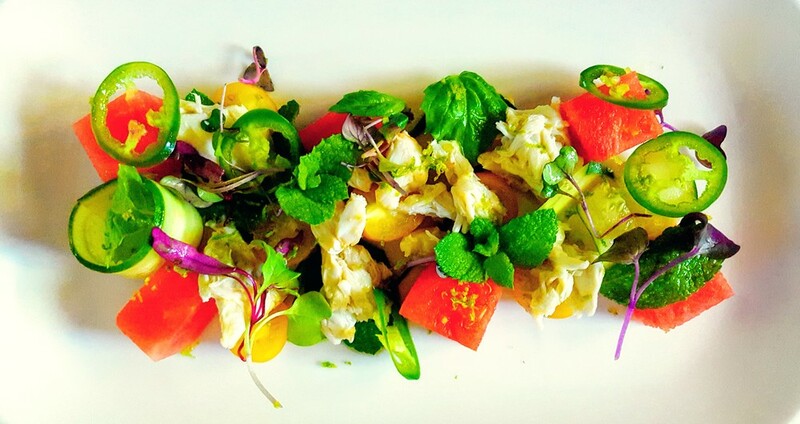 This crab salad will keep you and the kitchen cool on a warm evening. Use lump crab meat here, or anytime you use crab really. Claw meat isn’t as tender and has a much stronger flavor that most find unpleasant. Jalapeño is low on the list of the world’s hottest peppers, but it can still be too spicy for some. To help with this, wear gloves and then remove the seeds and veins. Capsaicin, the active ingredient in peppers that gives them their heat, is mostly contained in the seeds and veins. Make sure you wear gloves for this though, as capsaicin can remain on your hands even after a thorough washing and any contact with your face will burn quite a bit. Mache greens are a small tender green available at most farm markets. They are soft in texture with a nutty flavor and beautiful dark green color. They usually come with the root bundle still attached and a lot comes in a package. If you have a few extra plant pots hanging around, plant whatever you don’t use to come back to later. They do well in mixed sun and loose rich soil. Add lime juice to a blender and slowly drizzle in olive oil with the motor running. Season with salt and pepper to taste then set aside. Toss mache greens, basil, and mint lightly in lime dressing. Plate your watermelon, tomatoes, and cucumber before adding your dressed greens. Lightly dress the crab meat and plate amongst the rest of your salad. Garnish with shaved jalapeño and lime zest then season lightly with salt and pepper.